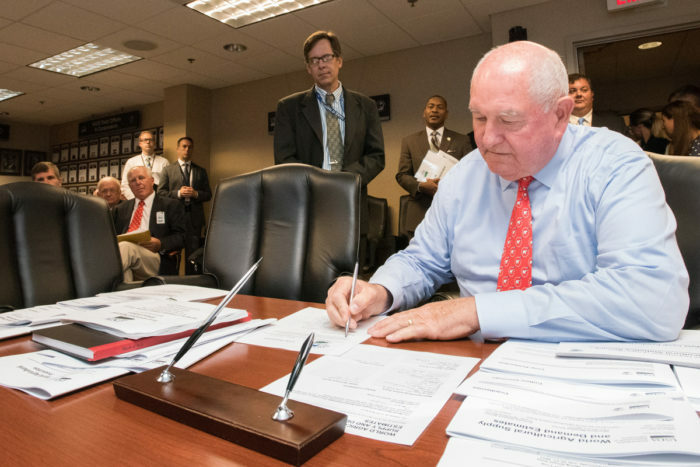 Can the USDA continue to do its work amid major reorganizations and minimal appointments and new hires? The Trump Administration has been riddled with high-profile scandals since the President took office. But looking beyond the front page reveals yet more controversy, as the President and his cabinet appointees struggle to fill essential roles within the agencies. The Trump White House has lagged far behind the prior administration in this regard. And in the U.S. Department of Agriculture (USDA), many are concerned that notable absences could hamstring the agency’s policy-making efforts dramatically. Almost from the start, the USDA has been hobbled by the inexperience and inefficiency of the administration. 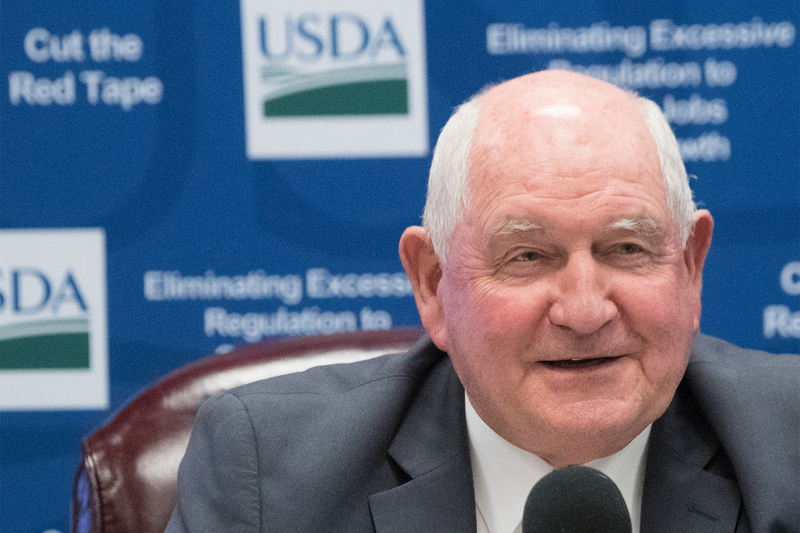 Secretary of Agriculture Sonny Perdue was the final Cabinet member named, and his confirmation took three months to complete. Since Perdue was sworn in, though, the USDA has begun making dramatic organizational changes, while also dealing with some high-profile absences among its top leadership—obstacles that could complicate the agency’s need to pass a new farm bill, advocate for a substantial slice of the shifting federal budget, and maintain its work in rural development, conservation, nutrition, and other essential programs that shape what we eat and how. Shortly after being confirmed in March, Perdue announced he’d be leading the USDA’s first major reorganization since the mid-1990s. The first stage of the reorganization created a new Farm Production and Conservation mission area, and an under secretary role to support it. The mission area encompasses a wide scope of the agency’s work, including risk management, crop insurance, commodity programs, and conservation. Perdue’s reorganization also pioneered the new role of under secretary for trade and foreign Agricultural Affairs, one designed to “ensure USDA speaks with a unified voice on international agriculture issues” and promote U.S. agricultural products. Sonny Perdue signs reports produced by National Agricultural Statistics Service on August 10, 2017. Anna Johnson, policy programs associate at the Center for Rural Affairs, says that the new assistant secretary role doesn’t appropriately replace a Senate-confirmed under secretary for rural development. If rural development doesn’t get the same treatment as other mission areas in this regard, she says, “we don’t get that chance to get a sense for who the new leader of that enormous portfolio is going to be.” And if rural development doesn’t remain a USDA mission area, Johnson wonders how rural leadership will retain its place at the table. Secretary Perdue announced the second stage of the USDA’s reorganization in September, including moving a program of the Food Safety Inspection Service (FSIS) under the newly-created Trade and Foreign Agricultural Affairs mission area, and creating a new Innovation Center within the Rural Development mission area. 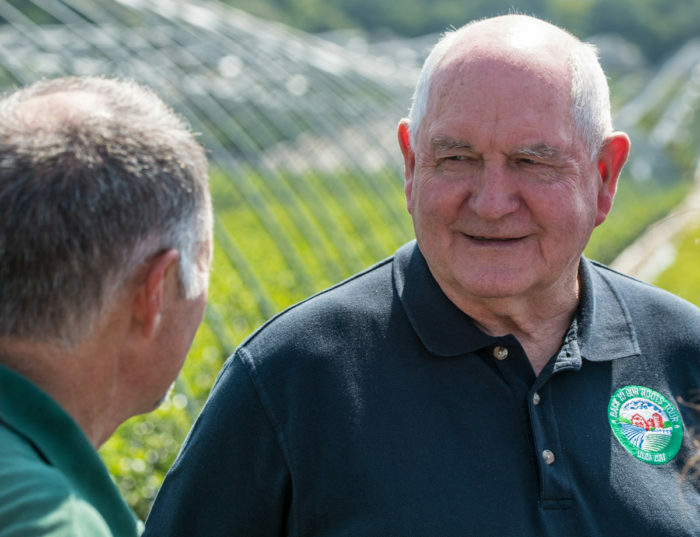 Sonny Perdue at Prides Corner Nursery in Lebanon, CT., on August 31, 2017. Perhaps most controversially, the reorganization moves the Grain Inspection, Packers, and Stockyards Administration (GIPSA), formerly housed across several programs, to the Agricultural Marketing Service (AMS). This move has caused concern among many food and farm advocates because the two programs have historically served to counterbalance one another. Barbara Patterson, the director of government relations at the National Farmers Union (NFU), notes that another consequence of moving GIPSA to AMS is eliminating the role of GIPSA administrator, who serves as an “advocate within USDA” for farmers and competitive markets. Who’s Picking Up the Phone? Among the political appointee roles that have been filled, two trends have emerged: prior work experience on the Trump campaign, and prior employment in the agribusiness sector. 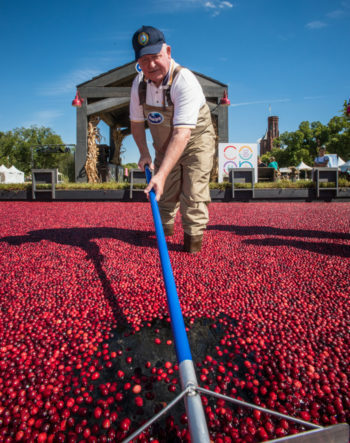 Sonny Perdue borrows some waders from Ocean Spray Cooperative at their demonstration cranberry bog on the National Mall in Washington, D.C., on September 29, 2017. Politico found in a recent investigation that 22 of 42 political appointees at the USDA had some Trump campaign experience, and few of them had prior experience in agriculture—or the credentials required for the positions they hold. For instance, Sam Clovis, the President’s controversial pick for Chief Scientist at the USDA, was chief policy advisor for Trump’s campaign, but has no science background himself. Stephen Vaden, Trump’s recent appointment for General Counsel at the USDA, was part of the Trump transition team. Since Secretary Perdue was confirmed, only a handful of political appointees have had hearings. Deputy Secretary nominee Steve Censky and Ted McKinney, who was nominated for the newly-created under secretary for trade and foreign agricultural affairs position, testified before the Senate Agriculture Committee on September 19 and were confirmed on October 3. Censky has been CEO of the American Soybean Association for two decades, and McKinney worked for Dow Agrosciences before becoming the director of the Indiana State Department of Agriculture in 2014. Bill Northey, who was nominated for under secretary for farm production and conservation, and Greg Ibach, who was nominated for under secretary for marketing and regulatory programs had their confirmation hearings on October 5, but have yet to be confirmed. Northey has served as the Iowa Secretary of Agriculture since 2006, and Ibach has served as Nebraska Secretary of Agriculture since 2005. Meanwhile, many top-level positions are still left unfilled, including under secretaries for food nutrition and consumer services, and natural resources and environment, as well as assistant secretaries for administration, civil rights, and congressional relations. The USDA did not respond to a request for more information on the status of those nominations. As debates and hearings on the 2018 farm bill continue, filling the lingering vacancies at the USDA is only becoming more pressing. Fogel says that each presidential administration has had its own way of engaging with the bill, from crafting its own extensive policy proposals to barely engaging at all. The USDA traditionally plays a crucial role in advising Hill staff on how to shape the bill. And yet there is still no nominee for assistant secretary for congressional relations, the office that manages the USDA’s relationship with Senate and House agriculture committees, among others. Meanwhile, several major USDA rules remain in a holding pattern. In January, the administration finalized the Organic Livestock and Poultry Practices rules, which codify increased animal welfare standards for organic livestock. But it has delayed implementing the rules until at least November. The Farmer Fair Practices rules, written under the Obama Administration and meant to be implemented in April, were also delayed until October. Photos courtesy of the USDA. Large-scale industrial farm companies subject farm animals to the most horrifically cruel conditions imaginable. Providing them with even more dominance is horrifying. Trump must be impeached as soon as possible. Informative article, albeit depressing. Please keep it up and dig deeper. You forgot to insert "due to Democrat's obstructionism" in your comments. AND it looks to me like everyone is trying to protect their piece of the pie. There are to many program heads and too many divisions of interest. I have been working long enough in the system to see the explosion of growth at the top and the reduction in force at the bottom. We are asked to do more and more because someone at the top is trying to show how essential he or she is, It is very tiring to fill out, yet again, one more form.